After reading the Awesomely Addictive raves about Reeseâ€™s Peanut Butter Egg, I was ecstatic to find Reeseâ€™s Peanut Butter White Egg and Reeseâ€™s Peanut Butter Fudge Egg at Walgreenâ€™s for fifty cents each. I generally love all Reeseâ€™s candy, and couldnâ€™t wait to get home and try the eggs. I wasnâ€™t sure what to expect – would the peanut butter be mixed with different flavors, or would the coatings just be different from the usual milk chocolate? I randomly chose to open the White Egg first, and took note of the flat-back egg shape similar to the Almond Joy and Mounds Eggs. The White Egg was solidly encased in an off-white substance that looked and felt a little oily. My excitement dwindled, and I cautiously bit into the candy. My taste buds were immediately stimulated by the unbeatable, salty-sweet taste and rich texture of Reeseâ€™s peanut butter. The peanut butter seemed extra tasty, and Iâ€™m not sure if thatâ€™s because it was fresher than the Reeseâ€™s products Iâ€™ve eaten in the past, or because the white coating was so unremarkable in flavor that the egg seemed to be purely peanut butter. 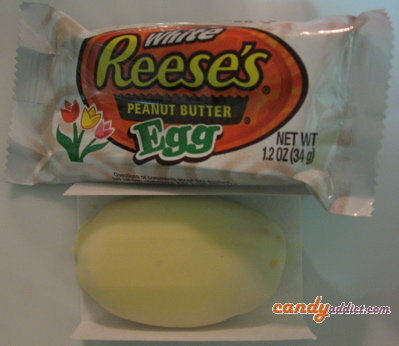 The White Egg lost points on appearance and coating, but Reeseâ€™s saved themselves with their superb peanut butter. The Fudge Egg was next in line. It, too, had that flat-back shape, and the coating was similar in color to dark chocolate. The Fudge Egg wasnâ€™t oily like the White one, and I was very interested to taste how Reeseâ€™s handled fudge. Disappointed? Yes. Disgusted? No. The Fudge Egg tasted similar to a regular Reeseâ€™s Cup, but had an unnervingly not-quite-right fudge aftertaste. It took three bites to really notice the fudge flavor, and when I finally did, I wished I hadnâ€™t. The peanut butter was the good quality that I expected, but this time the coating overpowered the filling. 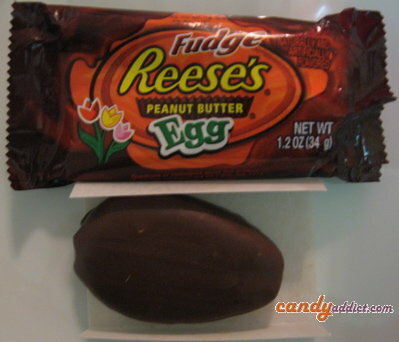 Unless youâ€™re interested in variety, I say stick to the original Reeseâ€™s Peanut Butter Egg. The White and Fudge flavors just arenâ€™t that good, and with all the Easter candy out there, why settle for something less than great? omg i know. What is with fake fudge? It all has this really distinct flavor… corn syrup? Artificial additives? Powdered somethings? Hehehe. My anti-spam verification word was “candy.” I don’t know if that was intentional or not, but it’s hilarious all the same. My roommate and I bought a big package of the fudge eggs, and couldn’t figure out what the difference was supposed to be. Thanks for clarifying for us that we’re not crazy, and that it’s basically just fudge-flavored milk chocolate. We both agree: Not too tasty at all. Stick with the original.